Can your child tie their own shoes? Your little ones can start brushing their teeth by themselves if they can lace up their own sneakers, usually around age 6. However, just like they might need help getting their laces untangled, you should still keep a watchful eye to make sure they’re brushing like a big boy or girl. Make brushing fun by playing music or adding incentives to get them excited about oral healthcare! It’s brushing time! For the healthiest pearly whites, your children should brush twice a day, for 2 minutes each session. But what kind of toothbrush should they be using? The truth is, whatever brush will make them want to clean their teeth more. Electric brushes are easy to use and have built in timers, but your son or daughter may like the Cinderella or Superman themed manual brushes found at your local grocery store. 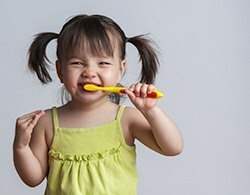 Getting your child to brush their teeth can be hard, right? Well, it gets easier if they find a toothpaste that they like. The best toothpastes for your kids contain fluoride, a classic cavity-fighter and tooth protector. Thankfully, there’s products now that are made with fun flavors geared towards children like strawberry or chocolate. 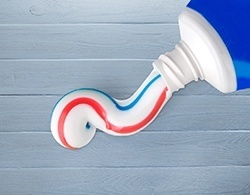 The key is finding a toothpaste that’s fun and tastes good, but also contains fluoride to protect their teeth. 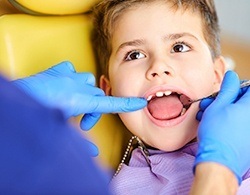 Are your kids flossing once a day? It’s usually the most difficult part of oral healthcare for children because of the tangled strings and maneuvering around each tooth. Show them how grownups do it, using a new section of floss for each tooth for a thorough cleaning. 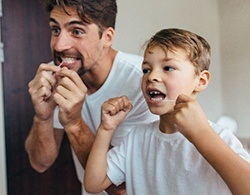 If your child struggles to use floss correctly, give them convenient pre-strung floss picks to teach them how flossing can remove annoying bits of previous snacks. Skip the sodas and sports drinks for water. Most water contains fluoride, a natural chemical that magically protects teeth from cavities. Does your child love sugary snacks? Limit them to eating candy or sugar once a day, after meals. Saliva created from chewing food will help wash away sugar naturally. You can also give them different colored fruits instead of candy for a healthy snack. For an easy, fun, and healthy dessert, skewer up different fruits to make a kabab. Cover it with dark chocolate for a fun and healthy dessert. You can cut strawberries, pineapples, melons and more into bite-sized chunks to create a rainbow effect. Then, drizzle some melted dark chocolate over the top to make sure your kids know its dessert time! 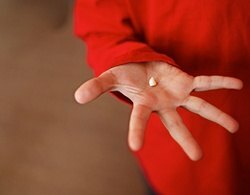 Has the tooth fairy visited your kids yet? Most children lose their teeth around the ages 5 or 6, but there’s some wiggle room—just like with their teeth! The first part of their smile to go is the bottom front teeth. That means you’ll have all the photo opportunities you could ever ask for with your cute, gapped tooth children. You’re probably just as excited for the tooth fairy to come as your little ones! So, your child just lost their first tooth, or it’s hanging on by a thread. What’s next? Do you have your story straight? The tooth fairy is a magical creature that needs teeth to build her castle, duh! Explain to your children that losing their teeth can be messy and sometimes uncomfortable, but it’s worth it in the end when they wake up to a well-earned reward under their pillow from the tooth fairy herself. Wisdom teeth: they don’t actually make you wiser. They got their name because wisdom teeth typically grow in as you get older (and hopefully wiser). They are usually removed between ages 16 to 20, but in some cases, children may have them removed around 12 or 13. Wisdom teeth can cause damage to the smile, inflame gums, and cause other oral health issues. That’s why dentists take X-Rays to keep an eye out for these extra teeth.